Action Drivers Select HO 1/64: Diecast cars with opening hoods HO, engine detail and rubber tires. Action Pit Stop 1/64: Diecast cars with less detail and packaged in a clear window box. Similar to '06 Team Caliber Pit Stop. 2007 Shane Huffman #88 NAVY SEALS / Chevrolet Monte Carlo SS diecast, by Action. 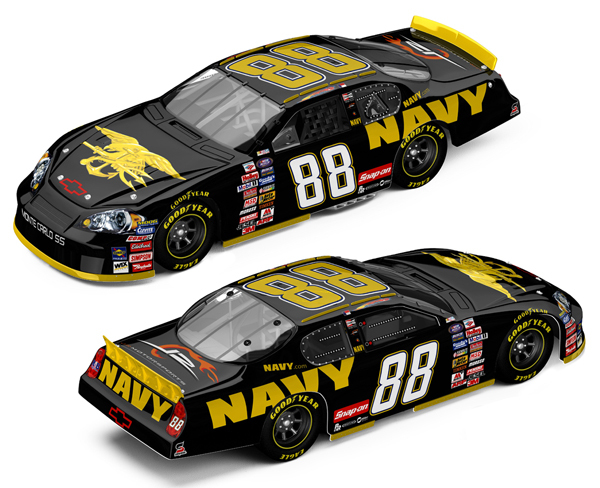 The JR Motorsports #88 NAVY SEALS Chevrolet was raced by Shane Huffman in select events during the 2007 NASCAR Busch Series season.